Financing refers to the methods and types of funding a business uses to sustain and grow its operations. It consists of debtSenior and Subordinated DebtIn order to understand senior and subordinated debt, we must first review the capital stack. Capital stack ranks the priority of different sources of financing. Senior and subordinated debt refer to their rank in a company's capital stack. In the event of a liquidation, senior debt is paid out first and equityShare CapitalShare capital (shareholders' capital, equity capital, contributed capital or paid-in capital) is the amount invested by a company’s shareholders for use in the business. When a company is created, if its only asset is the cash invested by the shareholders, the balance sheet is balanced through share capital capital, which are used to carry out capital investments, make acquisitionsMergers Acquisitions M&A ProcessThis guide takes you through all the steps in the M&A process. Learn how mergers and acquisitions and deals are completed. In this guide, we'll outline the acquisition process from start to finish, the various types of acquirers (strategic vs. financial buys), the importance of synergies, and transaction costs, and generally support the business. This guide will explore how managers and professionals in the industry think about the financing activities of a company. On a company’s cash flow statementCash Flow Statement​A Cash Flow Statement (officially called the Statement of Cash Flows) contains information on how much cash a company has generated and used during a given period. It contains 3 sections: cash from operations, cash from investing and cash from financing., there is a section that’s referred to as cash flow from financing activities, which summarizes how the business was funded over a particular period. Managers of businesses have two choices when it comes to funding activities: debt or equity. There are pros and cons to each, and the optimal choice is often a combination of each. 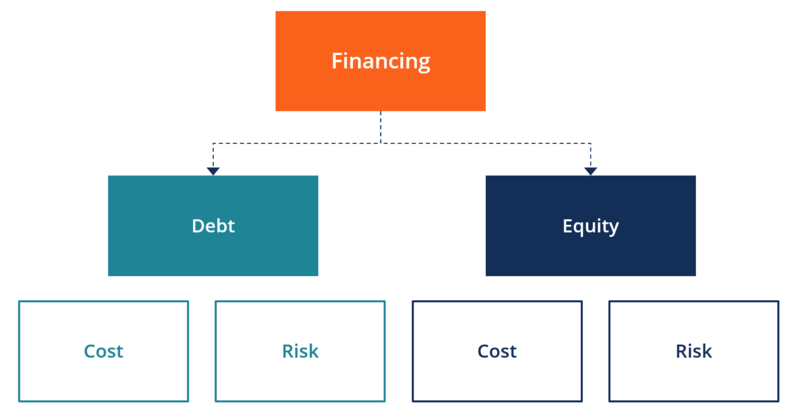 The decision between debt vs equity financing is what ultimately determines a company’s capital structure. The optimal capital structure for a business is typically considered that which results in the lowest weighted average cost of capital (WACC)WACCWACC is a firm’s Weighted Average Cost of Capital and represents its blended cost of capital including equity and debt. The WACC formula is = (E/V x Re) + ((D/V x Rd) x (1-T)). This guide will provide an overview of what it is, why its used, how to calculate it, and also provides a downloadable WACC calculator. While that’s true in theory, in practice, managers of firms tend to have preferences depending on how risk averse they are. When managers of business think about their financing strategy, there are many factors that need to be taken into account.